It seems that more and more things we did as younger students are making their way to online platforms. Memphis startup Boosterville is disrupting the school fundraiser and bringing it online and to the mobile phone. Gradfly is helping students manage their online portfolio. Boston startup Abroad101 is the trip advisor for students studying abroad, and that’s just a few. Now, a Chicago startup called ProjectTravel has launched their crowdfunding platform to the public. 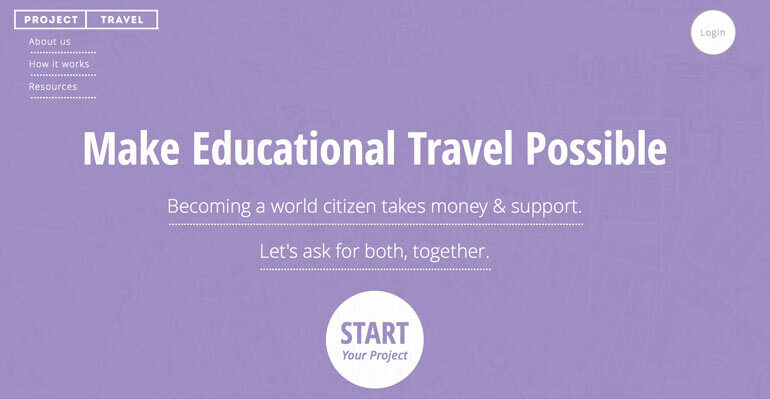 ProjectTravel allows students that are going on educational trips to crowdfund that trip well beyond their tiny network of local family members who have been left holding the boot. Project Travel partners with academic institutions, non-profit and third-party program providers to help more students and program participants go abroad, while directly advising them on how to successfully peer-fund and offering online international education resources. The fundraising platform launched its private beta in January 2013 and has been honing the online experience for travelers in preparation for its public launch. Taking advantage of current web design trends and online crowd-funding best practices, the platform offers a user-friendly way for Project Starters to connect with potential donors and supporters. Thomas has just completed an extensive beta test of the platform and sure enough there is wide interest. Now the “peer funding” site is launched and anyone who is raising money and support for educational travel experience through a school or organization can use the platform. To Project Travel, educational travel includes: studying abroad, volunteering, interning, teaching, service language, language and cultural exchanges and much more. Project Travel vets all of the applicants before their projects show up on the site but they’ve left the criteria incredibly open ended so almost anyone can take advantage of it that has a legitimate educational travel mission planned. You can find out more about Project Travel here. Check out this other recently launches Chicago travel startup BTSocial, the social network for business travelers.